Lucas Hnath asks some big questions in The Christians, and while his refusal to lead us to a definitive truth is thought-provoking, the intellectual exercise overpowers much of the heart. While one can view Hnath’s ambiguity as a metaphor for those who turn to religion for answers but do not find them, the main thrust of The Christians is about what happens when our fundamental beliefs are challenged. What price are we willing to pay for those beliefs? Arriving to give a sermon on his megachurch’s tenth anniversary, Pastor Paul has not only come to announce his church is now debt free, but to also declare a fundamental shift in his ministry. A message from God himself, Pastor Paul now maintains hell does not exist, and everyone has a place in heaven. As it turns out, even Hitler. Grappling with this idea, a split begins to emerge in both his congregation and personal life. As members begin to abandon his church, questions as to the timing of Pastor Paul’s revolutionary theological proclamation begins to unravel what he has worked so hard to achieve. Ironically the spiritual debate which ensues inside Pastor Paul’s megachurch – complete with “a baptismal the size of a swimming pool” – is presented inside the intimate Pacific Theatre. Designer Stancil Campbell gives the illusion of grandeur inside the intimate Pacific Theatre. Photo by Jalen Saip. 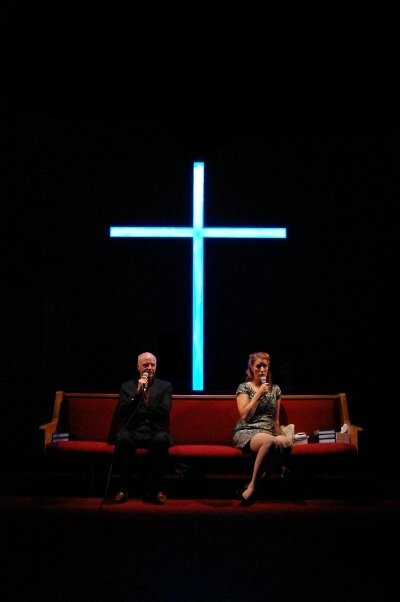 Set designer Stancill Campbell gives the appearance of grandeur with large neon-lit crosses on either side of the Pacific Theatre’s tiny alley theatre. A luxurious carpet covers the floor, while two large television screens oversee the proceedings, providing the words to hymns and other church information. The small stage is also filled with a 15-person choir on risers (the line-up of which changes nightly). Led by director, Lonnie Delisle, they not only fill the theatre with wonderful musical interludes between sermons and testimonies, but will eventually take sides in the debate. A church pew on stage is filled with both actors and audience, and we are encouraged to sing and clap along as if we are members of the congregation itself; actors greet and welcome us to the church. And even while the audience is never given the opportunity to take sides like those on stage who choose to stay or go, the immersive nature does help somewhat to draw us deeper into the discussion. Continuing this illusion, the playwright dictates the use of microphones through the entire proceedings. As if ensuring those at the far reaches of the massive church can hear, even the most intimate of conversations are amplified. Wired, the tangle of cords become yet another metaphor for this debate. Discarding their use by one character towards the end, Hnath underscores the possibility of new beginnings, whether we agree with them or not. Hnath uses another device, with Pastor Paul interjecting “he said” or “she said” as characters speak. For a show going to great pains to present both sides of this cerebral examination of belief, it essentially places the control of the narrative with Pastor Paul. 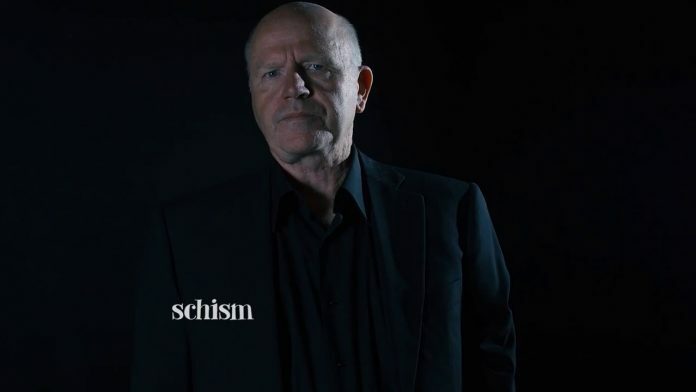 Is this a true representation of the schism building among his congregation, or simply his recollection on what has taken place? Undermining its core, the result is seemingly at odds with the playwright’s refusal to take sides. 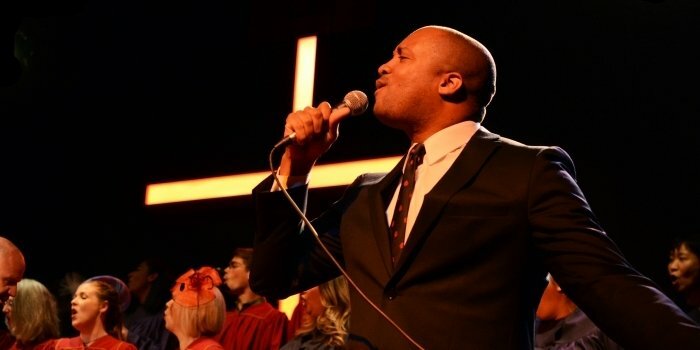 Tré Cotten as Associate Pastor Joshua in the Pacific Theatre production of The Christians. Photo by Jalen Saip. Under the direction of Sarah Rodgers, Ron Reed is a more subdued and thoughtful minister than what we have been led to believe are the stars of a modern megachurch; he is the antithesis of Billy Graham, Jerry Falwell, and Joel Osteen. It is difficult to see him as a man with the charisma necessary to attract thousands of followers, but his genuineness does makes his arguments more believable and human. As Associate Pastor Joshua, Tre Cotton makes his Canadian stage debut with a steadfast resolve as to his character’s convictions. His final scene is among the few heartfelt counterpoints to what Pastor Paul has lost. Erin Ormond brings a quiet stillness to the role of Wife Elizabeth, which is contrasted as she later begins to question her husband. Her reaction to his shift in beliefs, from the intimacy of their bed, is one of play’s biggest secular access points. It becomes a larger metaphor, transcending doctrine. As the debate’s biggest counter-argument, Mariam Barry is called upon to make the most damaging of accusations. Going head-to-head with Pastor Paul she is unyielding, but where the others on stage capture the naturalness of Hnath’s dialogue, Barry struggles. Finally, as Elder Jay, Allan Morgan makes the most of his relatively small role. Called upon to represent the church’s board to address Pastor Paul’s surprising revelation, he finds a nice balance to the needs of the church, and that of his friend. Largely an intellectual exercise, The Christians spends the bulk of its time inside our heads and that of its characters, but it never truly touches us where it should, in our hearts. The Christians by Lucas Hnath. Directed by Sarah Rodgers. On stage at Pacific Theatre (1440 West 12th Ave, Vancouver) until October 7. Visit http://pacifictheatre.org for tickets and information.